For the most part, white BBQ sauce is still a regional product. Born in the deep South, Alabama in particular, the mayo based product isn't what most people think of when they picture BBQ sauce. Fortunately, companies like Firebud Brands are working to bring this unique style of sauce to the rest of America. Firebud Brands' Alabama Salvation Sauce is packaged in 16 oz. plastic bottles. The labels are simple (see above). The sauce isn't bright white. It's somewhat of a cream color with dark spices visible throughout. Salvation Sauce is quite thin and pours quickly. Salvation Sauce is a blend of mayo and cider vinegar making it equal parts creamy and tangy. 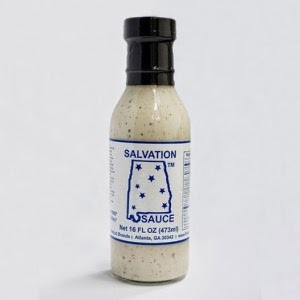 Accented with plenty of pepper and savory spices, Salvation Sauce goes beyond the traditional Alabama version. Additionally, the Firebud sauce adds a kick of spice with the inclusion of horse radish. I used Salvation Sauce on several occasions. It was fantastic right out of the bottle. Though thinner, it had a very similar flavor profile to the horseradish sauce that I make to accompany prime rib. I used it as a dip for vegetables, french fries and chicken strips. I also poured Salvation Sauce over smoked chicken and roasted venison. Regardless of how I used the sauce, it was exceptional. The flavor was bold and complex, but managed to compliment just about everything we paired it with. Salvation Sauce's strength is its versatility. It can be used like a BBQ sauce for smoked or grilled meats. It can also be used as a mayo substitute in salads and on and sandwiches. It's been my "go to" condiment for the last few weeks. I've only sampled a few white sauces in my time. Each was very good. Thanks to the addition of horseradish, Salvation Sauce is the best of the bunch. It's the type sauce you can use daily and pair with nearly every meal. It's as good as any product that I've reviewed in recent memory. Learn more about Firebud Brands and purchase your own sauces here. 1 Response to "Firebud Brands Alabama Salvation Sauce"